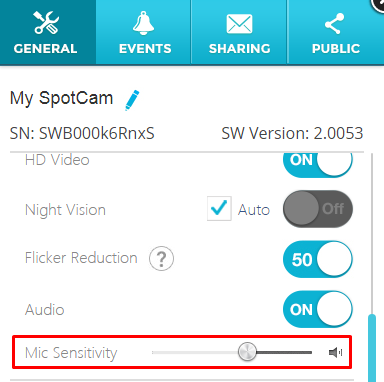 Since SpotCam adopts high sensitivity microphone for sound recording, it will capture not only foreground and also background sound at the same time, and the background sound sometimes may cause slight noise when you hear camera audio. That being said, please be informed the noise from the background sound should not overrun the foreground sound, means you should be able to hear main sound in the foreground clearly even though slight background noise might exits. If you feel you are hearing too much background noise, you can also try to adjust microphone sensitivity in camera setting to find the best sensitivity for your environment. If you think you are haring abnormally loud noise when watch your video, also adjust microphone sensitivity doesn’t resolve your problem, then please feel free to contact our support staff and we will help you resolve the problem immediately.